Hello, Today I'm sharing a card I'll use for a Christmas cookie exchange and I used some svg files from Doodlebug Designs. 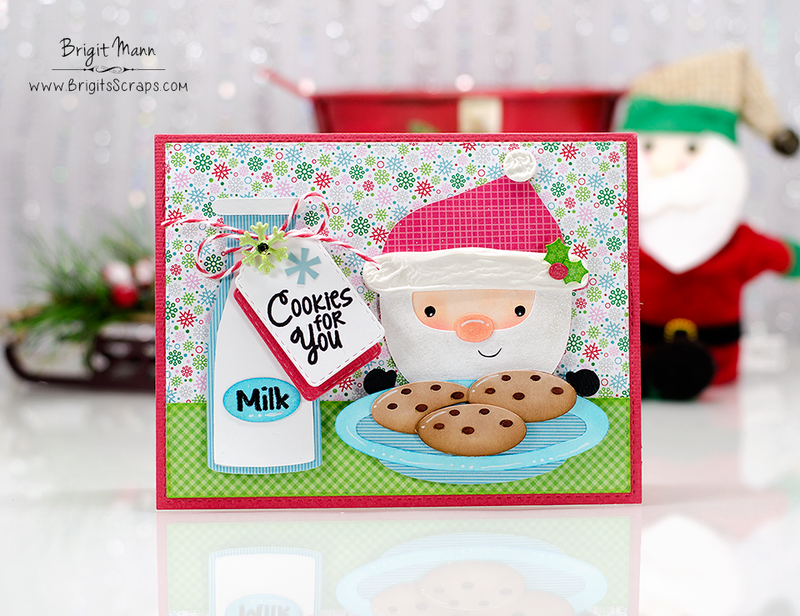 The milk jar and plate of cookies from the Here Comes Santa Claus collection along with the adorable Santa are totally adorable and perfect for this card! All the svgs were cut out on my Brother Scan N Cut 2. The two stamped images are from Jaded Blossom's Milk and Cookies set and the cookies tag is from MCT's Fun Stitched Tags. All designer paper is from Doodlebug Design's Here Comes Santa Claus and Petite Prints pads. I used some Liquid Applique on Santa's pom pom and hat trim, gives it some puffy texture and some clear wink of stella on his beard. The twine is Berry from Annie's Paper Boutique. Oh so CUTE Brigit! Adorable card!